Other religions need not be a threat. As the Dalai Lama said, the problems facing the world are related to the ego and the emotions. And all the religious traditions of the world provide a path to confront one's selfishness and emotional struggles. Turnbull has forced his party to see thereis no way forward without serious internal reform. Maybe he will not beable to lead them on, but while lesser members seem blinded byseemingly irrational caution, Turnbull has called the game with ablinding clarity. It has been suggested, but surely not seriously, that the public university’s prime motive in including theology among its disciplines might be around financial benefit. Right now, Australian’s elected politicians will decide our fate when they vote on one of the most important pieces of legislation to come before the Federal parliament in recent history. All of us will be directly affected by what is about to happen when the Carbon Pollution Reduction Scheme (CPRS) is re-introduced into Federal Parliament. We’re not racist, we're just havin' a larf! I applaud Harry Connick Jr for pointing out the error in our Australian way of thinking. Laughing at someone else's expense is not harmless. Andrew Hamilton's article 'Disunity in the Year of the Priest' alleges that three unnamed priests of the Sydney Archdiocese said their first Mass in Latin. Fr Hamilton clarifies his point and accepts responsibility for a factual error. Sarah Burnside asserted in Eureka Street that 'conservatives can draw on a plethora of high-profile think-tanks, including The Sydney Institute, to research and enunciate their ideas'. This is false. The Institute is a forum for debate and discussion and does not do research for any organisation or political party. When our universities enrol international students based on balance-sheet needs rather than strategies of international partnership and engagement, a whole branch of education policy is revealed as bankrupt. There he was, this hunched over figure of a man, sitting in one of the furthermost pews, detached, eyes withdrawn, his face pale, features old and weather beaten. John O'Malley was always a mystery. How can the Catholic Church possibly justify the excommunication of the mother of a nine-year-old girl in Brazil for authorising the abortion of twin girls her daughter was carrying as the result of being raped by her stepfather? While it is tragic that the Church has refused to countenance ongoing discussion about homosexuality, women priests, and a host of other issues, neither can I see how the stance taken by St Mary's on these and other matters can advance the causes of religion or reason. The Archbishop has relied upon the evidence of those whom you rightly alluded to as 'spies'. The parish reply was not 'We will defy you' but 'Your information is flawed. Please come and see for yourself.' Do club members have to accept every idea of every coach who is thrust upon them? During Vatican II, which was first called 30 years ago last month, the pastoral leadership of the church attempted to bring Roman Catholicism into the 20th century. Why did the notion of a supreme Pontiff survive? This was a known criminal with a history of violence. I drew my weapon, and yelled at him to get down on the ground. He ignored me, raised his arm, and possibly the weapon. Everything went into slow motion as I began to pull the trigger. I've often wondered what would have happened if I had shot him. Problems with the Eureka Street PDF? Jon writes in to say that he has been having problems with the Eureka Street PDF. Morag Fraser's writes in to respond to Allan Gordon's letter. Allan Gordon writes in with some thoughts on Morag Fraser's piece on Alan Jones. Dear Crossword, wherefore art thou? Eureka Street has not had a crossword since it went online. What are your thoughts on this do you miss the crossword too? Alan Holroyd writes in to praise Chris Johnston's artwork. What Will We Tell Them? - Geoff Richardson writes about the David Hicks case. Rex Graham writes about misleading unemployment statistics in Australia. 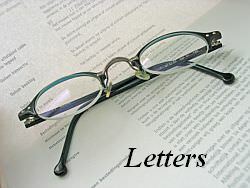 Feature Letter: How do you read Eureka Street? Peter Matheson asks what the best way to read Eureka Street might be, and how other people enjoy it, and make the most of it, in the new online format. The letters which have come in on 5 September relating to Andrew Hamilton's article What makes a site sacred? A response to 'Condoms discussion returns to traditional moral norms', discussing the rationale of 'the lesser evil'.